Replica of Gerrit Rietveld, 1917 The red blue chair. A design he modified to resemble Piet Mondrian's paintings when he came into contact with the artist's work in 1918. 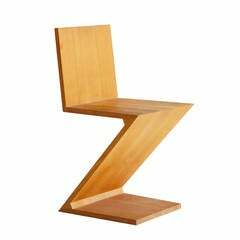 In 1917 Rietveld joined the De Stijl movement, in 1919, becoming one of its principal members. 1990s reproduction of Harry Bertoia metal pair of chairs, diamond model. In blue color. 19th century Philippine pair of red velvet armchairs. Set of 32 Spanish made iron chairs in their original blue color. 1980s Wittmann´s Austrian red leather chairs Pair of Wittmann´s Austrian chairs with elegant straight line design using top quality red leather. Zig-Zag chair, designed in 1934. Originally made by Meubelmakerij Adr. van Rietveld. Reissued in 1973 by Cassina, Milan. Stamped 1228 of 1973 production. Elmwood.